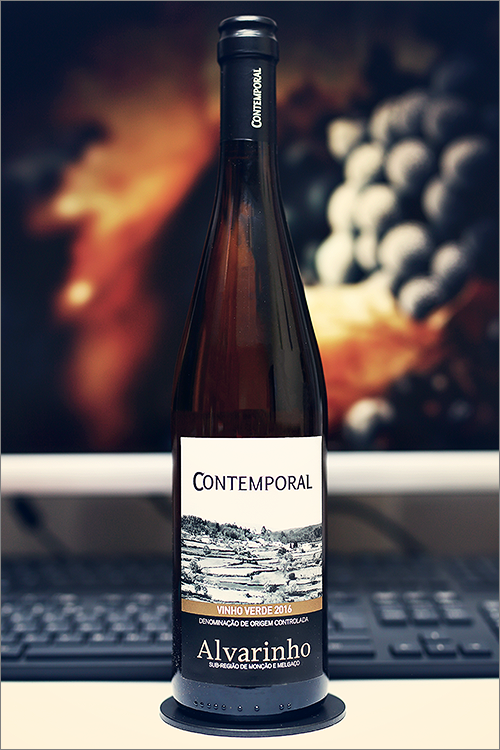 Today we are going to review yet another Vinho Verde wine – Contemporal Vinho Verde Alvarinho 2016 from Quintas de Melgaço, produced in the Minho region, which shares the same land area as the Vinho Verde region. Vinho Verde is quickly becoming the visit card of Portugal – crisp, dry and citrusy-floral – this stuff is crazy refreshing. Vinho Verde is usually a blend of several local white grapes, yet this one is a single varietal albariño wine, known domestically as ‘alvarinho’, which is a thick skinned variety, that makes it ideal for coping with the damp maritime climate of Spain and Portugal. The skin helps protect the grape from sea winds and allows the sugars within to fully ripen. But enough theory, let’s move straight to the tasting and find out how good this wine really is. Clear and bright yellow color, with pale topaz-yellow shades towards the rim of the glass. The nose is strong, filled mostly with sweet fruits and citrus flavours: pineapple, lemon, straw grass, bergamot, yellow apple, overripe gooseberry, ripe yellow pear candy, quince, yellow melon, hay, wetstone and some subtle hints of banana. The wine is dry, with high alcohol level, high acidity and ripe tannin. It tastes crisp, lean and citrusy, a bit zesty yet quite smooth at the same time. The wine has a nuanced fruity accent and it feels refreshing and sweet due to it’s fair, yet elegant overall balance. It has a medium-plus finish and a balanced, crisp and zesty aftertaste. This is definitely a great Wine of Portugal and the overall rating says the same, with 90.6 points scored it is right there, among the best wines we’ve tasted so far. Please click on the chart icon on the left in order to get to the wine rating page, where you can find all the wines we’ve tasted to date. Conclusion: this is a wine in its prime form – ready to drink and not really worth for any more bottle ageing. The highly aromatic wines like Vinho Verde are not meant for ageing, as they are mostly enjoyed young, due to their opulence and lack of structure. In order to amplify those appealing aromatics, we would recommend to pair this wine with light and crisp seafood dishes, like for example fresh oysters with just a squeeze of lemon juice or some seared scallops with orange-lime dressing, as the seafood’s strong flavour will complement almost to perfection the fruity-citrusy aromatics of the wine. Enjoy!